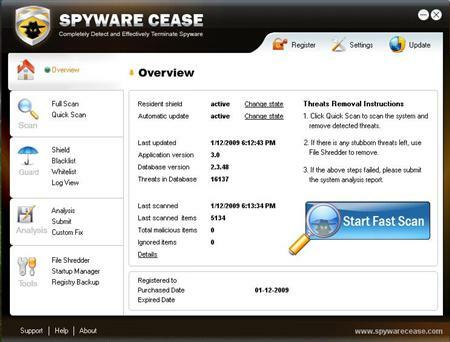 Spyware Cease offers the technology-oriented protection against the latest spyware threats like keyloggers, Trojans, adware, malicious cookies tracking, browser hijackers, worms, phishing attacks and other malicious spyware attacks. Spyware Cease can effectively eliminate the unwanted pop-ups, minimize identities thieves and speed up PC performance. What's more, Spyware Cease enables the real-time guard in the background. Spyware Cease safeguards that your online activities, such as shopping, banking transactions and Internet surfing, are completely safe with ease. If you have a problem we can not automatically remove with the latest Spyware Cease, our expert team will create the complete custom fix for your specific spyware problems. Spyware Cease conserves computer resources by identifying and removing spyware programs that eat up your PC memory and CPU. Provides real time protection against all major threats. Qweas is providing links to Spyware Cease 6.0.2 as a courtesy, and makes no representations regarding Spyware Cease or any other applications or any information related thereto. Any questions, complaints or claims regarding this application Spyware Cease 6.0.2 must be directed to the appropriate software vendor. You may click the publisher link of Spyware Cease on the top of this page to get more details about the vendor.